I am going to breed mice and have been doing a lot of research on genetics and lines etc. But I can't really understand it? Could someone please explain to me how it all works please? I have been researching for a really long time and I know a lot about the care etc. for the mice. Hello! If you don't understand how it works, it might not be the thing for you. Have you already owned mice? If not, I recommend you keep mice as pets before you rush into breeding them. Also, what is you suppose for breeding? Having many tiny babies may pose as difficult and requires time and money. Sorry for all the questions! And welcome to to forum! Genetics and lines can be confusing -- as long as you know the rest of mouse breeding, are prepared for the possibility that you will be forced to hand feed or keep many of the babies, then you might be ready. What is it about the genetics that confuse you? Where will you be buying your stock? Is there another nearby breeder to ask? Definitely do not consider breeding mice if you have not kept them before, or do not understand their genetics. Breeding is a dangerous process for all the mice involved, and it is nothing that a beginner should be treading in. I say if you're interested in mice, keep a boy or a trio of does as pets and maybe get into breeding once you've been keeping them for a year or so. When I said care for them I meant for the mothers who are pregnant. I was researching about the increase in protein etc. I have had mice for three years. Also I have begun to figure out the gentics. My stock will be coming from another breeder who is teaching me the how to's. Can this breeder not explain genetics to you? Notice how "bb" is blue eyes, and "BB" is brown eyes. 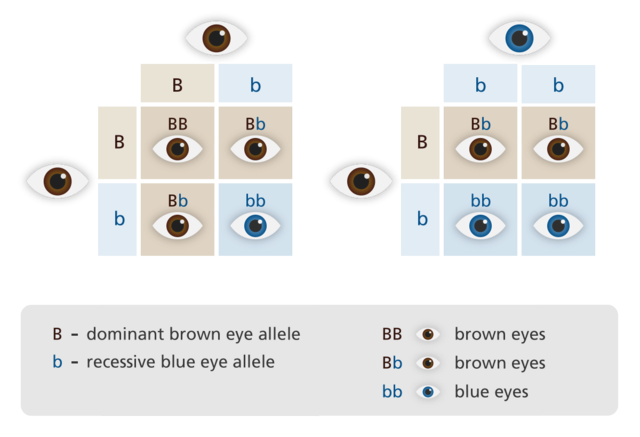 Brown is a dominant eye color, and blue is a recessive eye color. So, the child would have to receive a copy of the blue-eyed gene from both parents in order for the child to have blue eyes. Otherwise, the brown-eyed gene, being dominant, would take over, and the child would have brown eyes. If the child receives a copy of a brown-eyed gene, and a blue-eyed gene, the child would have brown eyes, since the brown-eyed gene is still dominant. It's the same with mice. Depending on which genes you are looking at, one gene might be dominant over another. So, for example, the "broken marked" gene in a mouse is "ss" according to the AFRMA. Notice the letters are lowercase, this indicates that the gene is recessive. So just like you see in the human eye chart above, the mouse would need a copy of this gene from both parents in order for the mouse to look broken marked. Thanks for that! The breeder was not very confident either but because NZ has a very limted number of breeders I have to get my stock from there. The mice are healthy and well looked after though. I have been doing so much research so that I can breed some of the colours that are disappearing in NZ. Ooh! Thanks for that Applecheeks! Is it okay if I message you when I get stuck? Just had first litter and pretty confident that it will be okay but just in case.